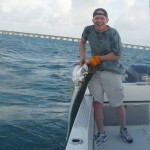 I recently traveled to the Florida Keys with my heart set on catching a tarpon. I arranged for a fishing charter months in advance but my original charter captain cancelled the trip the evening before we were to go out. He cited poor fishing and high winds as the excuse and refused to take my money. I thanked him for his high moral fiber and dug a little deeper into the predicament. After a little further questioning he folded up like a mallard at 20 yards. I learned he had booked a larger group, I was bumped, and he offered no solution. This type of thing happens all the time. I can’t stress enough the importance of going through a reputable charter or outfitter. Fortunatley for me I was able to reach Captian Buddy LaPointe who runs a charter service out of Marathon Shores in the Keys. I contacted him at 7 pm the night before my only available day to fish. Although he had the following day booked he was more than willing to help. He made a couple calls and got back to me within an hour. He was able to hook me up with Captain Doug Starliper from Always Enough Sportfishing. Captain Starliper had just put his boat away for the season but was sympathetic to my situation and agreed to take me out the following day. Although it was the very end of the tarpon season Captain Starliper lived up to the name Always Enough Sportfishing and was able to get me on the big guy pictured below. 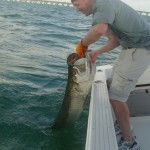 It was an excellent experience and catching a tarpon was everything I had expected it to be. If you would like to experience the excitement of catching a fish as challenging, and wild, as a tarpon I would encourage to head to the Florida Keys and contact Capt. Doug Starliner at Always Enough Sportfishing www.alwaysenough.com or Capt. Buddy LaPointe at www.fishin-buddy.com. I would also encourage you to give them more notice than I did. The Rasch Outdoor Chronicles has a nice review of BORE TEX on their site. Feel free to follow the link here. ST. LOUIS– New for 2010 PRO-TEX Outdoors, LLC has introduced its new glare and reflection eliminating scope caps. Today’s hunting and shooting optics are excellent for most situations but can lose effectiveness in scenarios with excessive light that create inhibiting glare or allow a reflection that can alarm your down range target. OP-TEX caps are the only objective covering scope caps that eliminate glare and reflection, are lightweight and flexible, have no moving parts, and do not obstruct your view of the intended target. ST. LOUIS– New for 2010, PRO-TEX Outdoors, LLC has introduced its new safe and accurate muzzle protection caps. BORE TEX muzzle protection caps were created to provide a durable way to cover and protect the barrel of a firearm while not compromising safety, accuracy, or the integrity of a gun. They will keep the gun barrel free from debris and are durable enough to protect the end of the gun barrel from impact damage. They are the only muzzle protection caps that combine the features above and can be shot through safely.